The basic body can be equipped with several different control packages in various combinations for controlling pressure and flow in large piping systems. The pressure control regulator directs water flow which positions the sleeve during operation. If the control function is pressure reducing, the sleeve position (or flow through the valve) is controlled by downstream pressure. 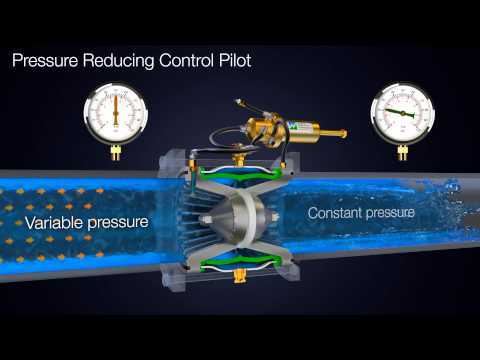 If the control function is pressure sustaining or relief, the sleeve position is controlled by upstream pressure. It's also engineered for extremely high efficiency, resulting in low friction loss and high capacity. It's light weight and compact for ease of shipping, handling and service. The only calibrated pressure control available in the industry. Convenient for setting correct pressure and for quickly checking proper adjustment range.